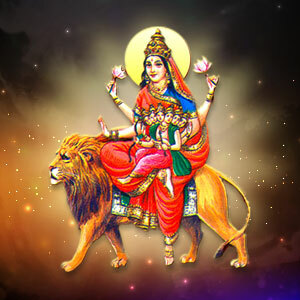 Skandamata puja is performed for attaining salvation and freedom. On the fifth day of Navratri, the puja begins with setting up an idol of Maa Skandmata. The idol is then purified by Ganga Jal. Do Kalash Sthapana by placing coconut on the water-filled pot of Silver, Copper or Earth. The devotees then drink the holy water from their palms and put a tilak on the forehead. Then, they offer camphor mixed water, flowers, honey, ghee, cow milk, Panchamrit, sugar and clothes or saree to Goddess Skandamata and worship her devotedly. Shodopchar puja of Maa SkandMata along with all established deities with Vedic and Saptashati mantras is performed. Offer all relevant pujan samagri to all the deities.